Creatine supplements are one of the most popular health supplements utilized by InsideTracker users and the general population. And it’s also one of the most controversial. While some hail it as a useful tool to increase muscle gains, boost recovery, and surge testosterone, others denounce it as an ineffective supplement that causes liver and kidney damage. Where does the real answer lie? In this piece, we cover all of the nitty-gritty research and distill what creatine supplements do and don’t do to your body. What is the History behind Creatine? Before we sort out the impact creatine supplementation has on the body and how it may increase your “Gainz” or inflict stomach cramping, we need to sort out the science behind it. Creatine, which is technically known as “creatine monohydrate”, is a small, nitrogen-containing organic acid that is found naturally in humans and other vertebrates. In the body, it is commonly found in one of two forms. It can be attached to a high energy molecule called a phosphate group where it is known as “creatine phosphate.” The second form, called “creatinine”, is a breakdown product of creatine that is then excreted by the body. Creatine’s main function is to supply energy to cells in the body, especially those in muscle tissue, by increasing the production of the body’s primary energy molecule called “Adenosine Triphosphate” (ATP). When producing ATP, creatine phosphate loses its phosphate group and transforms to creatine monohydrate. It is eventually broken down into creatinine and excreted by urine. Thus, creatine phosphate is the main driver of the substance’s effects on the body. Also important: Despite having “creatine” in its name, the indicator of muscle damage “creatine kinase” is unrelated to creatine monohydrate! Ever since its increase in prevalence, creatine supplementation has been mired in controversy. While it is not considered to be a performance-enhancing drug, people wonder: Is it Safe? Can it make you stronger and less fatigued? Does it boost your endurance? Can it increase testosterone? Some even wonder: Does it affect your heart health? Below, we investigate the research and how you can use your blood data from an InsideTracker analysis to answer all of these questions. Is Creatine Safe to Kidneys and the Liver? Creatine supplements are most often associated with throwing your internal biochemistry out of balance and ultimately damaging your kidneys, liver, and blood. However, what does the research say about the toxicity of creatine in your body? In 2001, researchers assessed the effects of regular supplementation on athletes in a retrospective study. To do this, scientists recruited twenty-six athletes, 18 males and 8 females, from various sports with a median age of 24.7 year and body weight of 82.4 kg. Seven of these subjects reported no use of creatine, nine reported using it regularly for up to one year, and ten reported using it for 1-4 years. Blood was collected between 7:00 AM and 8:30 AM after a 12 hour fast. They evaluated levels of testosterone, cortisol, and growth hormone. Additionally, they asked subjects to answer a questionnaire on their history of creatine supplementation, medical history, training, and perceived effects of supplementation. It is important to put this research in context. First, it is important to take the proper amount of creatine. This means that when “loading” creatine, you should take no more than 0.3 g/kg/day for a week. 6 Then, once muscles have reached saturation, take no more than 5-6 grams/day of creatine. 6 Additionally, if you have a history of kidney or liver illness, do not take creatine. Key Takeaways: While many people believe that regular creatine supplementation is toxic to the body, research suggests otherwise. Key biomarkers, including liver enzymes and albumin, and organs in the body such as liver and kidneys, seem to be unaffected by creatine. Additionally, symptoms such as cramps are no more prevalent in users who take creatine supplements at a healthy dosage and with sufficient hydration. Recommendations: If you are taking creatine supplements, remember to take them at a reasonable dosage according to expert guidelines outlined above. Regularly monitor the impact of creatine on your body’s biochemistry using InsideTracker blood analysis, while paying special attention to the three liver enzymes that are indicative of a substance’s healthy usage. Does Creatine Actually Make you Stronger? When used properly, creatine supplements are a useful performance-enhancing supplement. However, do they actually improve your athletic performance? In 2003, sports physiologists sought to assess the effects of healthy creatine supplementation on muscle strength and weightlifting performance by conducting a meta-analysis on 22 high-quality research studies. When reviewing the literature, they paid special attention to gender, individual variability, and training history. A more recent study from 2011 assessed the impact of creatine supplementation dosage and frequency on muscle size and strength from resistance training in young adults. Researchers recruited 38 physically active, untrained university students aged 21-28 years and divided them into four different groups for a six-week long study. The first group of eleven subjects were asked to consume 0.15 grams of creatine/kg of body weight for 2 days/week for six weeks. They performed 3 sets of 10 repetitions of each exercise for resistance training 2 days/week. The second group of 11 subjects were asked to consume 0.10 grams of creatine/kg of body weight 3 days a week. They participated in the same resistance training exercise as the first group. The third group of 8 subjects served as a placebo for the first group while the fourth group of 8 subjects served as a placebo for the second group. Before and after training, researchers took measurements of muscle thickness, 1 –repetition maximum for leg press and chest press, and kidney function. Key Takeaways: Abundant research suggests that regular creatine supplementation improves gains in strength and muscle mass. These benefits may be more pronounced in men. Recommendation: If you are seeking to improve strength and increase muscle mass, consider taking. Follow standard creatine supplement guidelines, 0.3g/kg/day for a week followed by 5 grams per day afterward, to reap positive results. In a 2011 study, researchers recruited 22 health men and women with an average age of 21 years. They randomized 10 of them to take 0.03 g of creatine per 1 kg of body weight for 6 weeks. The other 10 participants were asked to consume an equivalent weight and frequency of placebo. The experiment was double-blind and placebo-controlled, meaning that the researchers and subjects did not know who received which supplementation. Scientists measured key metrics before and after the intervention such as body composition, maximal strength, and creatine concentration in blood. The researchers also measured muscle fatigue by having them perform five consecutive sets of 30 concentric knee extensions at 180 degrees. When assessing the key fitness metrics after the study’s six week conclusion, the researchers noted no significant difference in body mass, lean mass, body fat percentage, or total body water in either group before and after the intervention. Interestingly, the subjects who took creatine supplements were more resistant to fatigue during the sets. More specifically, they had 7% lower fatigue after set 2, 9% lower fatigue after the 3rd and 4th sets, and 11% lower after the 5th set. 9 In contrast, the placebo-controlled subjects experienced no significant improvement in fatigue resistance. Because of their findings, the researchers noted that “ingesting a low dose (≈2.3 g/d) of creatine for 6 weeks significantly increased plasma creatine concentration and enhanced resistance to fatigue during repeated bouts of high-intensity contractions.” 9 Thus, creatine may be a useful tool in managing fatigue as exhibited by traditional performance measures. Additionally, you can use blood analysis to determine if creatine affects key metrics of fatigue measured by InsideTracker such as creatine kinase, c-reactive protein, and cortisol. Another study evaluated the effects of creatine supplementation on biomarkers associated with overtraining. In 2012, Brazilian researchers recruited 25 male soccer players with an average age of 17 years old and randomly assigned them to one of two groups. The first group of consumed 0.3 g/kg of creatine while the second group consumed 0.3 g/kg of placebo tablets for seven days. The subjects were asked to participate in six 35 meter sprints at maximum speed with 10 seconds of rest between them. Blood samples were collected prior to sprints, just after the completion, and one hour after completion. Key Takeaways: A few decent-quality research studies suggest that regular creatine supplementation might be helpful in controlling symptoms of fatigue and inflammation such as elevated CRP. Creatine supplements make you stronger and might help you deal with overtraining. But how does it affect your aerobic endurance? One study from 2003 indicates not too much. In it, sport scientists recruited 19 athletic, non-vegetarian subjects with an average age of 21. They divided them into two separate groups. The first one of 9 subjects consumed 20 grams of creatine supplements per day for the first five days during the loading phase. Then, they consumed 2 grams of creatine per day for the next six weeks. The other 10 subjects consumed the same mass of placebo supplement for the same frequency and duration as the other group. To assess aerobic capacity and cardiovascular fitness, researchers had the subjects engage in an exercise regimen where they participated in cycling for three 20 minutes sessions at 40%, 50%, and 60% of their aerobic capacity. In order to quantify endurance, the subjects’ blood was assessed for levels of fat and carbohydrate oxidation. The researchers had the subjects also engage in a 20 minute cycling time trial in which they attempted to cycle for the greatest distance possible. Each of these tests were conducted before and after the intervention. Key Takeaways: Few studies have been performed assessing the impact of regular creatine supplementation on the endurance capacity of athletes and non-athletes. These few studies indicate that creatine supplement does not improve aerobic endurance. Recommendations: If you are looking to improve aerobic endurance, consider taking another supplement besides creatine. Does Creatine Boost your Testosterone? If creatine makes you stronger and boosts recovery, does it also increase your testosterone- a hormone crucial for optimal health and performance in both men and women? In a 2006 study, researchers measured the effects of creatine and creatine plus beta-alanine, a popular muscle enhancer, on metrics of power, strength, body composition, and hormone levels. Scientists recruited 33 male subjects and randomly assigned them to one of three groups. The first group consumed creatine, the second creatine plus beta-alanine, and the third a placebo. All three groups were asked to participate in regular resistance-training as well. Because research suggests that creatine supplementation increases muscle power, scientists surmised that regular supplementation could increase the ratio of dihydrotestosterone (DHT, a biologically more active androgen) to testosterone. In 2009, South African researchers recruited 20 college-aged rugby players and assessed the impacts of creatine supplementation on testosterone and DHT levels in male, college-aged rugby players in a double-blind, placebo-controlled crossover study lasting a total of 9 weeks. Researchers divided the subjects into two groups of ten. The first group of ten served as the intervention group and consumed 25 grams/day of creatine along with 25 grams/day of glucose for the first week. Then, for the next two weeks they consumed 5 grams of creatine per day with 25 grams of glucose per day. The second group of ten served as the placebo and consumed 50 grams/day of glucose for one week. Then, they consumed 30 grams of glucose per day for the next six weeks. Both groups were then asked to participate in a 6-week “washout period” where they consumed no supplements. 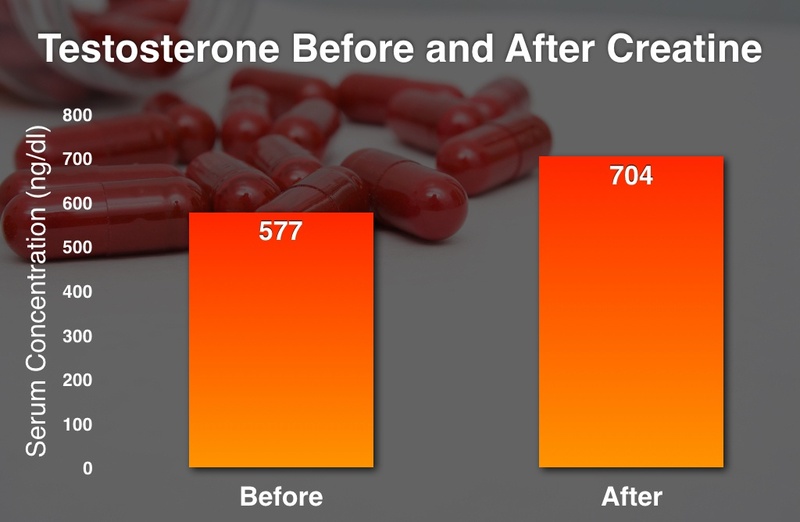 After seven days of creatine loading, or a further 14 days of regular-dose creatine supplementation, testosterone levels in these subjects did not change. However, levels of the more active form of testosterone, DHT, increased by 56% after 7 days of creatine loading and remained 40% above baseline after 14 days of maintenance. 14 Additionally, the ratio of DHT:T increased by 36% after one week of creatine supplementation and remained elevated by 22% after the maintenance dose. 14 The researchers stated that “creatine supplementation may, in part, act through an increased rate of conversion of testosterone to DHT.” 14 Thus, creatine may not lead to a measurable increase in testosterone levels but instead exert its effects by converting testosterone to a more active form. Key Takeaways: Research on the link between testosterone and creatine supplementation is conflicting. Some suggests that creatine increases testosterone levels, while other indicates that creatine improves a more active form of testosterone called DHT. More rigorous research needs to be done to evaluate the impact creatine has on the different forms of testosterone. Recommendations: If undergoing a resistance-training regimen and taking creatine supplements, use InsideTracker to see how creatine affects your testosterone levels. How Does Creatine Affect Your Cholesterol? While the bulk of research has focused on creatine supplementation’s impact on athletic performance, a couple of studies have observed how it affects biomarkers associated with cardiovascular health. In a 1996 study, researchers recruited 18 men and 16 women with total cholesterol concentration above 200 mg/dL. These subjects received either a supplement of creatine monohydrate (5 g of creatine and 1 g of glucose) or a placebo (6 g of glucose) for 8 weeks. Initially, each supplement was taken orally four times per day for five days. Then, for the remaining 51 days, the supplement was taken twice a day. Researchers measured blood samples before the intervention, 4 weeks after the intervention, at the completion of the study (8 weeks), and 4 weeks after the study’s completion (12 weeks). In a 2008 study, researchers assessed the effects of creatine supplementation on lipid levels in male subjects with healthy levels of lipids. They recruited 22 subjects and randomly divided them into two groups. The first group of 12 subjects received 20 grams of creatine per day for one full week followed by 10 grams of creatine per day for the next 11 weeks. They were of a healthy weight and had an average BMI of 23.2 kg/m2, had an average body fat content of 17.3%, and an average age of 24.4 years old. The other group of 10 subjects took an equivalent mass supplement of dextrose which served as a placebo. They were also of a healthy weight and had an average BMI of 24.1 kg/m2, average body fat content of 17.6%, and average age of 24.2 years. Both groups of subjects participated in moderate-intensity aerobic exercise for three 40-minute sessions per week for a total of 12 weeks and had the same diet. Researchers assessed key lipids of cardiovascular health in the subjects’ blood including HDL-C, LDL-C, total cholesterol, and triglycerides before the intervention, 4 weeks after the intervention, 8 weeks after the intervention, and at the conclusion of the 12 week trial. At the end of the 12 week, both groups of subjects had improved in both groups. However, there were no differences between the two groups and these benefits were attributed to the aerobic exercise regimen. As a result of these findings, the researchers stated that “creatine supplementation did not have any additive effect on the plasma lipid profile of healthy sedentary males undergoing moderate intensity aerobic training for 3 months.” 16 However, they emphasized how the subjects in this study had primarily been conducted in subjects with normal levels of cholesterol while those in Earnest et. al were conducted primarily in subjects with high levels of cholesterol. Key Takeaways: One credible study indicates daily creatine supplementation of 10g/day decreases levels of triglycerides and unhealthy VLDL cholesterol in subjects with elevated levels of lipids. Another study suggests that daily creatine supplementation does not affect lipid levels in subjects with normal levels of cholesterol. No studies suggest that creatine supplements will increase levels of triglycerides, total cholesterol, or LDL cholesterol or decrease levels of heart-healthy HDL cholesterol. 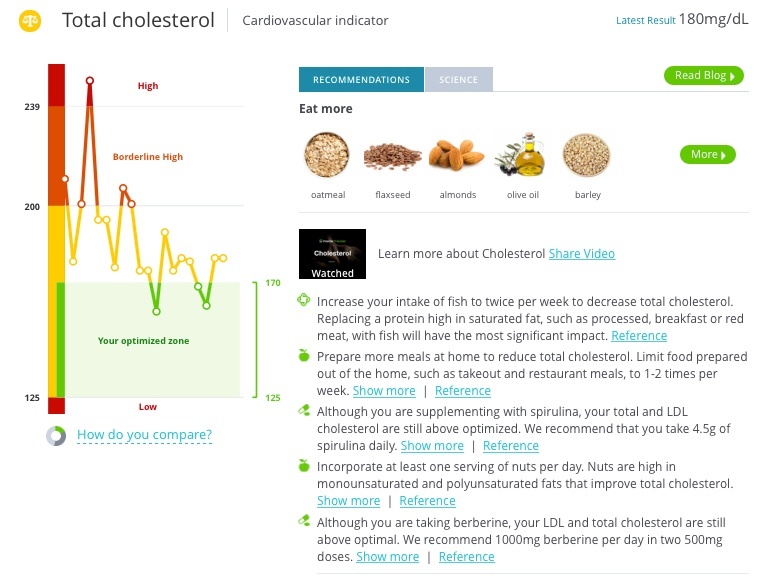 Recommendations: If your levels of lipids are elevated and you would like to increase your strength, use your InsideTracker results to see if creatine supplementation helps manage your lipids. Creatine supplementation is unlikely to decrease lipids further if your levels of lipids are already at a healthy level. Creatine is one of the most controversial supplements out there, and the internet has certainly fueled the ammo for both sides. But we straightened out some of the creatine confusion you. A lot of research suggests that key indicators of toxicity, such increased levels of liver enzymes and cramping, remain healthy when consuming creatine supplements at healthy levels. Abundant evidence indicates creatine increases your strength, but individuals may experience different gains. A moderate amount of research suggests that creatine decreases level of inflammation as indicated by lower levels of CRP. A small amount of research indicates that testosterone might increase your testosterone and optimize your lipid profile, but more inquiry needs to be done in this area. 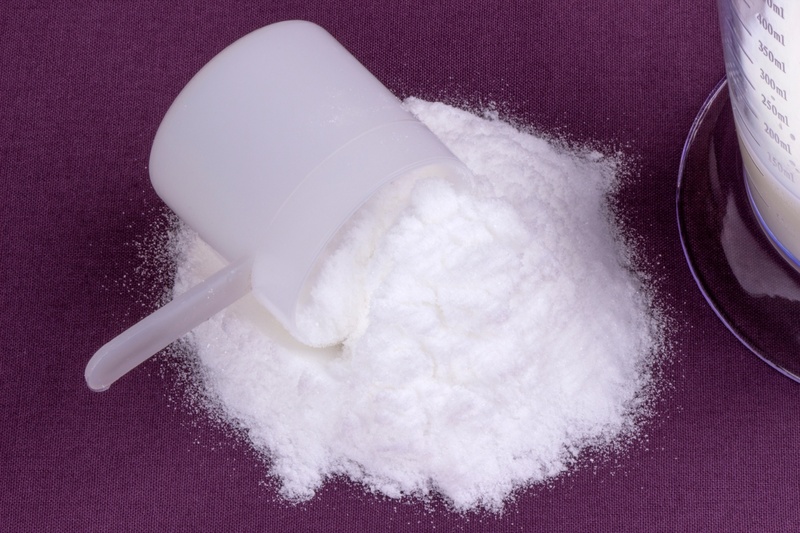 No research indicates that creatine supplements will help with your endurance. Is creatine right for you? Check with your doctor to see if you have healthy kidneys and liver. Then, take a trusted supplement brand that can be found here. 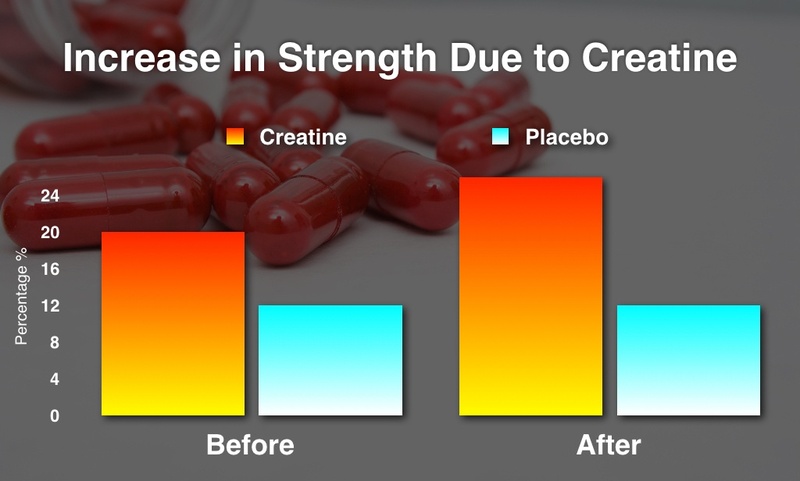 Generally, creatine supplements are taken at 20 grams/day for seven days in what is called the “loading phase” followed by 5 grams of supplement per day after this phase. Make sure to measure fitness metrics to see if it impacts your strength and endurance performance. And we will measure key biomarkers of health and performance on the inside to see how it affects you. At the end of the day, creatine holds promise- but your data will let you know it’s the right choice for you. Because we want you to be the best you possible, here's a FREE GUIDE we've created to help you gain an inner edge... it's yours to download! 1. Cannan, Robert Keith, and Agnes Shore. "The creatine-creatinine equilibrium. The apparent dissociation constants of creatine and creatinine." Biochemical Journal 22.4 (1928): 920. 2. Folin, Otto, and W. Denis. 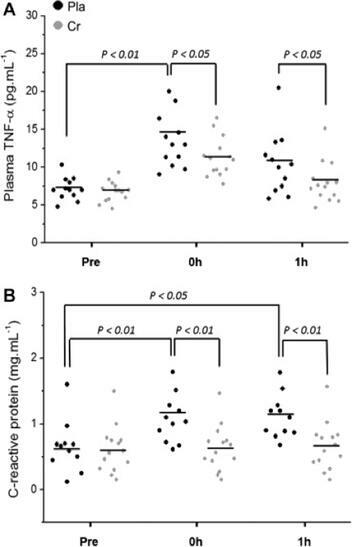 "PROTEIN METABOLISM FROM THE STANDPOINT OF BLOOD AND TISSUE ANALYSIS SECOND PAPER. THE ORIGIN AND SIGNIFICANCE OF THE AMMONIA IN THE PORTAL BLOOD." Journal of Biological Chemistry 11.2 (1912): 161-167. 4. Mayhew, David L., Jerry L. Mayhew, and John S. Ware. "Effects of long-term creatine supplementation on liver and kidney functions in American college football players." International journal of sport nutrition and exercise metabolism12 (2002): 453-460. 5. Schilling, Brian K., et al. "Creatine supplementation and health variables: a retrospective study." Medicine and science in sports and exercise 33.2 (2001): 183-188. 7. Rawson, Eric S., and Jeff S. Volek. "Effects of creatine supplementation and resistance training on muscle strength and weightlifting performance." The Journal of Strength & Conditioning Research 17.4 (2003): 822-831. 8. Candow, Darren G., et al. "Effect of different frequencies of creatine supplementation on muscle size and strength in young adults." The Journal of Strength & Conditioning Research 25.7 (2011): 1831-1838. 9. Rawson, Eric S., et al. "Low-dose creatine supplementation enhances fatigue resistance in the absence of weight gain." Nutrition 27.4 (2011): 451-455. 10. Cooper, Robert, et al. "Creatine supplementation with specific view to exercise/sports performance: an update." Journal of the International Society of Sports Nutrition 9.1 (2012): 33. 11. Van Loon, Luc. "Effects of creatine loading and prolonged creatine supplementation on body composition, fuel selection, sprint and endurance performance in humans." Clinical science 104 (2003): 153-162. 12. Thompson, C. H., et al. "Effect of creatine on aerobic and anaerobic metabolism in skeletal muscle in swimmers." British journal of sports medicine30.3 (1996): 222-225. 13. Hoffman, Jay R., et al. "Effect of Creatine and β‐Alanine Supplementation on Performance and Endocrine Responses in Strength/Power Athletes: 1120: 9: 45 AM–10: 00 AM." Medicine & Science in Sports & Exercise 38.5 (2006): S126. 14. Van der Merwe, Johann, Naomi E. Brooks, and Kathryn H. Myburgh. "Three weeks of creatine monohydrate supplementation affects dihydrotestosterone to testosterone ratio in college-aged rugby players." Clinical Journal of Sport Medicine 19.5 (2009): 399-404. 15. Earnest, Conrad P., A. L. Almada, and T. L. Mitchell. "High-performance capillary electrophoresis-pure creatine monohydrate reduces blood lipids in men and women." Clinical science (London, England: 1979) 91.1 (1996): 113-118. 16. Junior, Antonio Herbert Lancha. "Does creatine supplementation improve the plasma lipid profile in healthy male subjetcts undergoing aerobic training?." (2008).